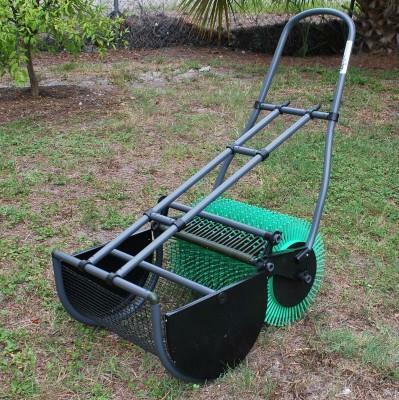 Easily picks up black walnuts, golf balls, sweet-gum balls, and other small objects. Much faster at collecting nuts and small objects. Takes little effort to push. Holds up to 30 lbs of walnuts in a easy to remove basket. No dust, environmentally friendly, uses no fuel. * Please call us with any questions about our nut picker sweeper 16 inch rentals in Oak Grove MO, Blue Springs MO, Independence MO, Lexington MO, Odessa MO, Independence MO and Western Missouri.